Need to distract the kids while you prepare Thanksgiving dinner? Try this Handprint Candy Corn Turkey! There’s nothing more frustrating than working on a time-intensive dinner for everyone while trying to juggle the kids. In order to keep them busy, pull out some materials and let them keep themselves occupied for a little while. Here’s a fun craft that the older kids can help the younger ones with. It’s like a traditional handprint turkey art, but glue on candy corns to make the colorful feathers. Have your child trace their hand to create the turkey outline. Draw a line where the fingers meet the hand to separate them and create a clear place for your child to color. Have your child color in the main part of the hand however they want. If you want to get really creative, hand over the sequins, gems or whatever craft supplies you have on hand for them to fill in the hand. 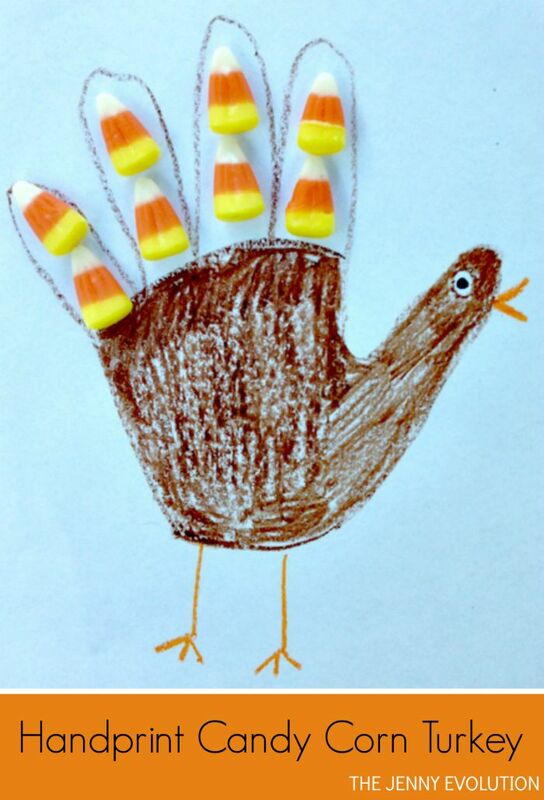 Let your child fill in the fingers using candy corn to form the turkey feathers. This is such a cute idea! Great way to use up that leftover Halloween candy too! Thanks so much for posting this on the turn it up tuesday link party. I’ll be sure to share this with my son’s preschool teacher!